Buffalo Wings and Rings, a Cincinnati-based franchise, plans to open a location in metro Detroit within the year and expand in Michigan over the next five years. The sports restaurant franchise has 80 units worldwide and has grown significantly since its establishment in 1984. The company states it is currently looking for a franchisee. Once a deal is consummated, up to 30 new locations in the region will be announced over time. The brand’s strategy for expansion is its “One Franchise Fee for Life,” which offers incentives for potential franchisees to open new locations within a 300-mile radius from their home market. The franchisee will dictate the general area for the location of the restaurant. “We start in the vicinity of where the franchisee is living. We do a lot of work in the community, and we live out of the community, so we think that it’s important to open the first restaurant where the franchisee has his or her roots,” says Philip Schram, chief development officer of Buffalo Wings and Rings. The restaurant’s menu offers hand-breaded wings cooked to order, hamburgers made in-house, as well as salads, sandwiches, and quesadillas. New eateries feature sleek, modern décor with 45 televisions throughout an establishment. 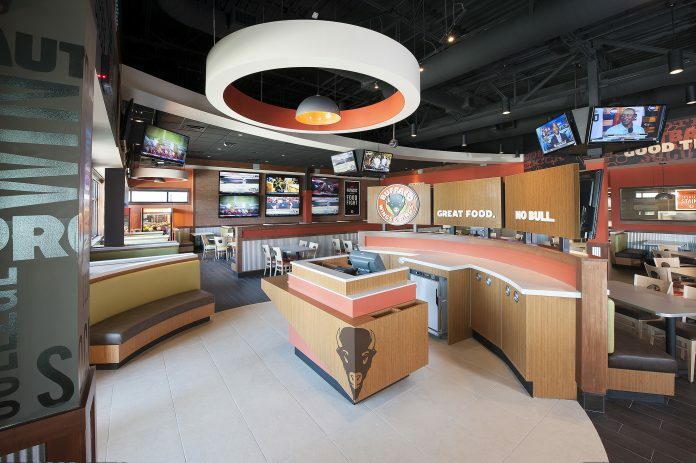 The typical size of a Buffalo Wings and Rings is about 6,000 square feet, seating 200 inside, as well as 30 on a patio. Buffalo Wings and Rings currently employs about 3,000 people in its 45 locations in the U.S.